Killzone 2: How Is It Selling? 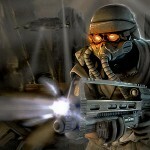 Ever since E3 2005, gamers have been patiently awaiting the release of PlayStation 3 exclusive Killzone 2. Now it’s out and has received incredibly positive reviews from critics (amassing a 91 on Metacritic). But how is it selling compared to say, Halo 3? And more importantly, is it giving PS3 hardware sales a much needed boost? I was curious, so I reach out to some retail managers around the country for a highly unscientific poll. The general consensus is that the game is doing well at retail, but isn’t necessarily moving PS3s — at least not yet. The real tale of the tape, of course, will come in March when we see the February NPD data. I’m sure KZ2 would have sold a lot more copies were it available for 360, but I doubt it would be a mega blockbuster game. It’s simply not that good. It would certainly have been smarter for GG to release a game that is trying to sell it’s big multiplayer, for the console with the biggest and best network in console gaming worldwide. PS3 exclusivity just doesn’t make sense for this game, but hey when you have more money than brains, you do stuff like that I guess. Sony has been sweating and wheezing like a fat kid chasing a ice cream truck, but they just can’t catch up. Too little too late. They just don’t get it. Hopefully the new, “thinner” Sony will make better decisions going forward. Right chubby?